While the name is of the movie is Batman v Superman: Dawn of Justice, we actually haven’t seen much of Batman and Superman actually going against each other. Thus far, the shots we’ve seen have involved the two characters giving each other very stern looks, but last night that changed as the first clip where the two actually get their hands on each other was released. Check it out below. The scene premiered on Jimmy Kimmel Live as part of his big post-Oscars broadcast, and it shows that Batman has his work cut out for him. First, Superman flies him through a building, knocking him to the ground. Then after, Batman thinks he’s got the drop on the Man of Steel, whatever the Bat fires from his gun, which is (probably?) not a bullet, gets caught in midair. Things are not looking good for Batman here. With a director like Zack Snyder, we didn’t really expect these two to spend the movie pulling their punches, but it’s nice to get a small taste of what we’ll be seeing when Batman v Superman: Dawn of Justice hits in a few weeks. Whatever happened immediately before this scene made Superman very upset. He looking to take down the Bat pretty hard. His aggressiveness will only reinforce Bruce Wayne’s opinion of the danger that Superman symbolizes. From what we can gather, both heroes view the other as a menace to society that needs to be taken down for the good of all. We know from one other clip that we’ve seen that at some point, Batman is able to physically block an incoming Superman punch, so eventually the Caped Crusader will be able to figure out a way to get the drop on his opponent, making the fight a little more even than what we see here. 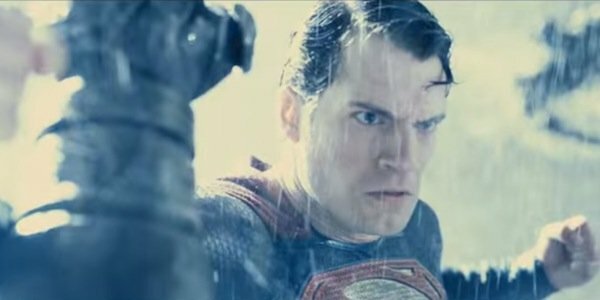 Batman v Superman: Dawn of Justice is one of the most anticipated films of the year. It’s designed to launch an entire franchise of DC comic book movies, many of which are already in various stages of production. There has been some concern from Warner Brothers that the movie may not be as successful as it needs to be. Fans are waiting patiently to see the superhero fight of the century. Well, in addition to the other superhero fight that is getting ready for us this year. We look forward to seeing the rest of the battle when Batman v Superman: Dawn of Justice arrives in theaters March 25.